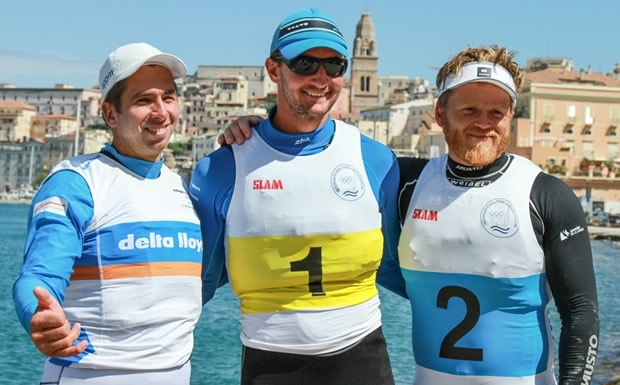 Giles Scott (GBR) lifted the Finn Gold Cup for the fourth time today in Gaeta, Italy, after a spectacular medal race sailed close to the shores of the impressive and historic old town. People from the town and local children crowded the shoreline to get a view of the Finn class strongman heroes as they battled hard against the beautiful backdrop of the medieval town. While Scott had done enough to secure the title, and the race for the silver was reasonably secure, the battle for the bronze was very hot. In the end Jonas Høgh-Christensen (DEN) took the silver and Pieter-Jan Postma (NED) took the bronze. The medal race was won by Høgh-Christensen. The medal race took place downwind of the town with the windward mark just off the shore. A local radio station entertained the crowds and immediately after racing the top three were take ashore for a medal ceremony under the town walls. A great initiative to involve a local school in the day included the three medalists presenting the winners of a painting competition started earlier in the week depicting the sailing at the Finn Gold Cup. It was a fantastic way to involve the local people and take sailing to the community that had hosted the event for the past week. Giorgio Poggi (ITA) led the medal race from the first mark to half way down the final run when Høgh-Christsensen found a gust and sailed past. Postma stuck close to Ioannis Mitakis (GRE), but nearly lost to Jake Lilley (AUS) on the opposite side. In the end nothing changed, except Mitakis got a flag on the final leg to drop to sixth while Lilley and Poggi moved up one place. It has been a challenging week in Gaeta, starting off with light and fickle winds and then a big day on Thursday with three races in big breeze that showcased the strong and tall gladiators to the max. Once again, Scott looks dominant, winning with a day to spare to take the Finn Gold Cup again, to go into the Olympics as the reigning world champion.